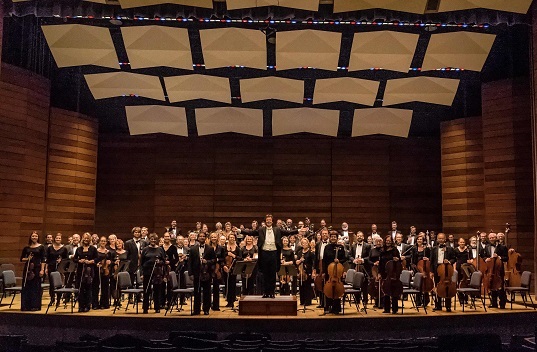 The Rogue Valley Symphony is committed to bringing great performances of live classical music to everyone in Southern Oregon and Northern California. We believe music has the power to enrich lives beyond measure and is essential to the human experience. Whether it’s your first time coming to our concerts or you’ve enjoyed our performances before, we strive to offer you an exciting and memorable experience. Organized in 1967, the Rogue Valley Symphony is a fully professional regional orchestra. Led by conductor Martin Majkut, the ensemble presents five Masterworks concerts per season from September through April. Each Masterworks series is presented in three venues: Ashland’s Music Recital Hall, Medford’s Craterian Theater, and Grants Pass’ Performing Arts Center. Diverse works by history’s greatest classical composers are paired with world-renowned guest artists, creating exceptional performances for all to enjoy. Music education is a primary part of our mission. We feature learning programs for students around the region, including “Chamber Players” and Carnegie Hall’s “Link Up Program” for elementary students, “Classical Coaches” for middle and high school students, and “Connecting with the Classics”, for students and parents alike. For tickets, concert details and more information, please visit rvsymphony.org, email tickets@rvsymphony.org, or call (541) 708-6400.